> Sequels generally don’t do it for me. In my mind, they are not so much an artist’s creative desire to carry a story forward as they are an excuse to cash in on a previous success. When I heard Jordan Sonnenblick was writing a sequel to his smash hit Drums, Girls, and Dangerous Pie, I was cautiously optimistic. I’ve met Jordan, and he didn’t strike me as a profit-motivated, megalomaniac like James Patterson. Jordan is down-to-earth former middle school teacher. “Profit-motivated” and “middle school teacher” don’t reside in the same universe. I was still curious to see why he would risk the original. I’m glad he did. 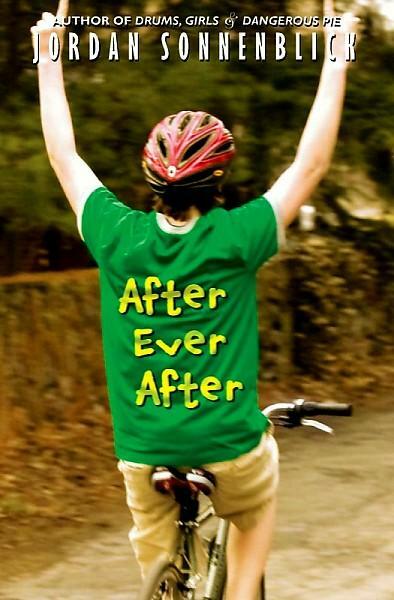 After Ever After is anything but a quick, profit-driven strike, although it should do very well because it’s an exceptionally poignant story that makes you want more. Steven, the eighth grader we met and instantly loved in Drums, Girls, and Dangerous Pie has flown the coop. The pressure has gotten to our hero, and he’s gone off to Africa to find himself. Apparently, the weight he felt watching out for Jeff – his cute, cancer-patient little brother – has become too great. Even after leaving for NYU, Steven couldn’t deal with Jeff’s constant e-mails, texts, or calls for advice or help. Steven wants to live his own life. Steven’s departure leaves his little brother, Jeff, in a lurch. The state, in its infinite wisdom, has placed even more emphasis on standardized tests. Eighth graders who don’t pass the math and reading portions of the test will be held back. Jeff is horrible at math; he believes his math ineptitude is the result of one of the chemotherapy drugs he took as a youngster. Jeff has also met a girl. When he needs Steven the most, he feels abandoned. But those are small potatoes compared to what’s coming next.